There are a number of things to keep in mind when planting and tending fruit trees. 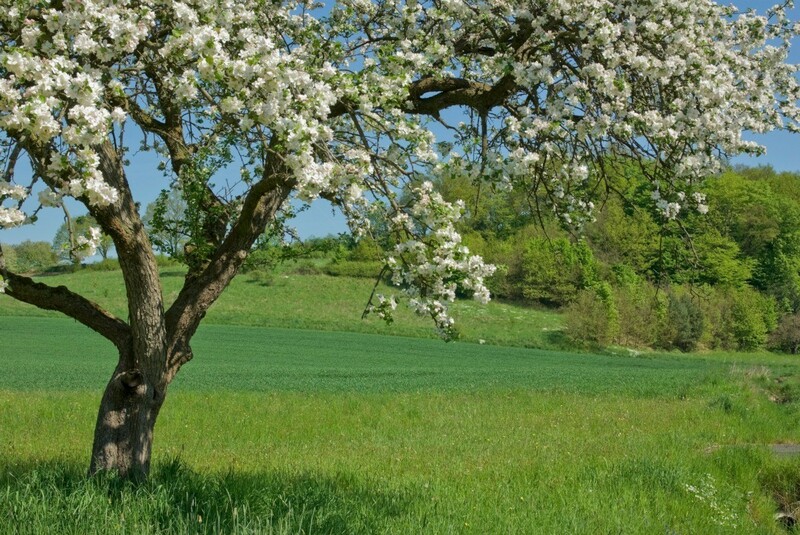 This guide is about growing apple trees. I would like to plant an apple tree for my husband. He always talks about one that he used to get apples from when he was a kid. What is a good one to plant that you can eat apples right off the branch? Also, what is the upkeep of one? Getting rid of worms etc. He never wanted to plant one of our own because of bees. But we don't have any little kids anymore living at home. we live in town now but when we lived in the mountains about 15 miles from town and we planted golden delious appple trees we bought from burgess catalog. the trees were about 3 yr old that we planted we lived there about 8 years and in the sixth year they were about 7 foot tall and started baring fruit after 3 years. we planted 4 of the same trees and done done good until some type bug killed three of them with blite. even though i seven dusted them they never did bare again good because i guess it takes at least 2 of the same trees to cross polinate. i think you have to have two near eachother so they can cross polinate to thrive good, at least thats what i have heard. when we moved to twon i planted a indian peach tree in honor of my mothers name but its not done well. not sure if it was because it had nothing to cross polinate with or what. its been in my yard for 9 years and the growth of the tree is dwarfish even though its not a dwarf type. it took 2 years to bare fruit but then it was full just small pit peaches and each year there after barely baring fruit. we are in eastern tenn zone. I think we are in similar temperature zones. My ultimate favorite for fresh eating and making pie filling is the Vista Bella. It is not common, so you will have to hunt, or I can send cuttings for grafting. It comes on in early August and is sweet/tart and keeps its texture in a pie like nobody's business. They don't hold very long, though. Two weeks is about their limit. I forgot the upkeep part. We take a 2 liter pop bottle, put in a banana peel, then mix a cup of vinegar and a cup of sugar and add that to the banana peel. Now top the bottle off with water and hang it up in the branches of the tree. It doesn't get them all, but it sure does a good job without poison. I would suggest contacting your local Extension Agent (look in the phone book) or the nearest University with an agriculture department to get some ideas about which variety will grow best in your area and the best tasting. You can probably do this all online. About the bees - you WANT them. You will only see bees during pollination and they don't want to sting you. If you are worried about wasps, make sure and pick up any fruit that falls on the ground. Your extension agent can give you the best advice for your area. You probably want to plant 2 trees of different kinds, and at least 10 or 15 feet from your neighbor's lot line. I'd be happy about getting bees, as long as they aren't the africanized ones. I don't think they're as far north as Maryland yet. Try to get a variety that self-pollinates, prepare for seven years before allowing it to fruit, so that it becomes strong and able to survive on it's own. Keep crossed stems cut away from each other, look for a dwarf variety, prune very little, feed a little Boron each year around drip line, worry more about tent caterpillars than bees which are beneficial AFTER the fifth to seventh year, spraying with BT before first leafing out for the caterpillars. Do not pull/prune fruit off that clump of first fruits, because not all of them will survive anyway. Make certain that your soil is well drained, that the tree has plenty of fresh air, that aphids aren't on the new growth, that there is a birdbath full of water nearby to discourage squirrels from stealing the apples, in the fifth-seventh year, because they are thirsty, says Jerry Baker, Master Gardener. with rabbit droppings since I have two house bunnies, with coffee grounds (only in Spring because it produces leaves mostly), banana peelings because it's partially supporting a rambling rose bush with long runners which likes the potassium from the chopped banana peelings. fruit in the toe of old sheer stockings, securing with twist tie. I have also hung rubber snakes on the tree branches, which seems to have discouraged the birds that used to get the ripe fruit first. Make certain it's planted in a HUGE FERTILE HOLE and in FULL SUNLIGHT, noting the fact that it will become about 15 feet tall and 8-10 feet wide. This is all I know. When the fruit is set, it's just wonderful, but we have a lot of rain that I hope you do not. If I had known what I know now, I would have given the hole better drainage, just in case. At first I thought the tree would NEVER produce fruit, because I was impatient and wanted to let the tiny fruit it produced in the first seven years to grow larger. However, I read that it is CRITICAL to remove all fruit off the tree for five to seven years, in order for the tree to concentrate on a strong root system. tree fertilizer and add a tiny amount of Boron around drip line in the Spring, as I mentioned before. WOW! Thank you for all the fantastic advice! Question: Do I Need Two Apple Trees To Get Fruit? I just purchased a Granny Smith apple tree from the local grocery store. I've done some online researching and wanted to confirm whether or not I need to purchase another type of apple tree so they will both produce fruit. Thanks and regards! As you know, it doesn't matter how prolific an apple tree flowers, if those flowers are not pollinated, you won't get apples! Apple trees are either 'self-fruitful', meaning they bear fruit after pollination occurs among their own flowers, or they are 'self unfruitful', meaning they require cross pollination from another apple or crab apple variety to produce fruit. Granny Smith apple trees happen to be a 'self-fruitful' variety. That means your chances of attaining a good fruit set year after year relies almost entirely on bees. They must find your lone apple tree and pollinate all of the flowers. More trees, equals more bees (hopefully). You will have a larger and much better fruit set each year if you planted another variety nearby (within 50 feet). Contact the nursery where you bought your Granny Smith for recommendations on which varieties will make good pollination partners for your Granny Smith. The most important consideration when selecting a second variety is to find one with a similar bloom time. This is because the first (and largest) blossom to open on each flower cluster on an apple tree is called the king blossom. It is called the king blossom for a reason-it must be pollinated for that flower cluster to produce a fruit. Ideally, the bloom time for both varieties will occur at the same time, or at least overlap. You may want to try your Granny Smith alone for a season or two just to see what happens, but you are sure to get a much higher yield if you find a partner for it. My dad, who was a farmboy in NC, always said you need two -- one male and one female. Don't ask me how you can tell. Refering to the "birds and the bees", it takes two, but remember bees will fly many, many miles in one day and will 'bee' carrying pollen from all over. I don't think you will necessarily need to have two (or more) right smack in your yard, unless it's what you want. My family and I live in the heart of the fruitbelt in Southwestern Michigan. As a matter of fact our yard is "landscaped" with Fruit. Growing up here, I worked for famly and friends on a LOT of farms. It depends on how much fruit you really want. You'll get better quality fruit also if you get a different kind of apple tree that, as Ellen mentioned, blooms at the same or a close time. And now to "nutshell" my comment: no. You don't NEED another tree, but it can help. I just wanted to thank you all for your replies. I planted just the one tree, for now. I guess I'll have to wait a season or two to determine whether or not it needs a mate. Or I can just learn a new hobby: become an apiarist! Nah.. my kids will never go outside! hehe Thanks again for all the wonderful info! Question: Is There Something Wrong with This Apple Tree? This is my first apple tree. This is the first fruit that it is growing. I don't know if it is one apple or many together? Any ideas? Wow! What an interesting picture. A fruit grower or arborist can tell you for sure, but I'm going to take an educated guess as to what could be happening. Apple blossoms form in clusters of five (or on rare occasions, six). The first, and usually the largest bloom to open is called the king bloom. If all goes according to nature's plan, the king bloom sets fruit first, which suppresses the setting fruit of the other blossoms. If all five blooms set, you end up with 5 smaller fruits, the other four blooms are usually removed in order to avoid this. Perhaps in your case, all five blooms set fruit and for whatever reason (maybe exemplary growing conditions) they all received enough nutrients to grow a decent size. As they continued to grow, the cluster of apples then developed a distorted appearance for lack of having any elbow room. My guess is that this is the only cluster on the tree that looks like this. Still another possibility is that early in the fruit's development your area experienced a sudden short burst of chilly temperatures-maybe a slight frost. When this happens and the skin of the fruit is damaged, apples (and also pears) sometimes develop what is known as frost rings. This doesn't kill the blossom or the fruitlet, but it can cause tough callus-like patches on the skin that constrict and distort the fruit as it grows. In either case, the apples are still safe for consumption. Based on your photo, it looks like you have a pear tree. If you planted it yourself or had someone plant it and still have the tags or paperwork you could check its botanical name. 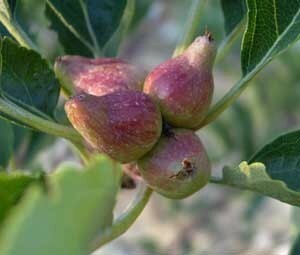 If it is an apple it will be in the "Malus" family and if it is a pear it will be in the "Pyrus" family. I see though that your post is from Italy, you may have species growing in your climate that do not grow commonly here. Are you sure it is an APPLE Tree? I thought it looked more like a pear tree, but even pear trees don' grow the fruit in clusters quite like that. I don't believe that it's a pear tree. Pears grow with the narrow end (stem end) attached to the tree. It looks as though the bud end is facing out. Apples do often grow in clusters like this, but these seem to be deformed. Are all the clusters like this, or is this the only one? Do you have an Extension Office at a University like we do here in the States? If not, see if you can e-mail the picture to one here in the US. They may be able to help you explain this. Apples are self incompatible and must be cross pollinated. Pollination management is an important component of apple culture. Before planting, it is important to arrange for pollenizers - varieties of apple or crabapple that provide plentiful, viable and compatible pollen. Orchard blocks may alternate rows of compatible varieties, or may plant crabapple trees, or graft on limbs of crabapple. Some varieties produce very little pollen, or the pollen is sterile, so these are not good pollenizers. Good-quality nurseries have pollenizer compatibility lists. Growers with old orchard blocks of single varieties sometimes provide bouquets of crabapple blossoms in drums or pails in the orchard for pollenizers. Home growers with a single tree and no other variety in the neighborhood can do the same on a smaller scale. During the bloom each season, apple growers usually provide pollinators to carry the pollen. Honeybee hives are most commonly used, and arrangements may be made with a commercial beekeeper who supplies hives for a fee. Orchard mason bees are also used as supplemental pollinators in commercial orchards. Home growers may find these more acceptable in suburban locations because they do not sting. Some wild bees such as carpenter bees and other solitary bees may help. Bumble bee queens are sometimes present in orchards, but not usually in enough quantity to be significant pollinators. Symptoms of inadequate pollination are small and mishapen apples, and slowness to ripen. The seeds can be counted to evaluate pollination. Well-pollinated apples are the best quality, and will have seven to ten seeds. Apples with fewer than three seeds will usually not mature and will drop from the trees in the early summer. Inadequate pollination can result from either a lack of pollinators or pollenizers, or from poor pollinating weather at bloom time. It generally requires multiple bee visits to deliver sufficient grains of pollen to accomplish complete pollination. It is definately an apple tree. Thank you for the valuable information. We will look into it directly. We have four seedlings grown from 'pips' from a South African variety. Our granddaughter planted the seeds from three she was eating. That was three months ago, they are now 6 inches (150mm) tall and in separate pots on a south facing windowsill. Do they keep their leaves over winter this first year? They are staying indoors. When and with what do I spray two apple trees? I pruned them in February. I'm certainly not an expert but I will tell you what we do. Nothing. We have never sprayed our apple tree and in the 8 years we have lived here (previous owners planted the tree, so I don't know how old it is) we have never had a problem with bugs. I like the idea of being able to eat food that hasn't been sprayed. Good luck. At garden center, wal-mart, Meijers, Fruit Tree Spray, it's a concentrate #17.00. read directions close. used in the spring when leafing/flowering. I have an apple tree, I don't know what kind, the fruit is red green with white flesh. It has had bugs, I think. They are not seen usually. I don't spray because the neighborhood kids will just take one and eat it. They are ripening way too soon and it's thought they have bugs/worms. What kind of organic bug/worm spray can I use? If they've got bugs, probably nothing will help this year. BUT, read up on dormant sprays for fall, and then for next year and absolutely perfect apples, read up on bagging apple trees, originally a Japanese idea, now very popular with the Home Orchard Society, in Oregon [google words and you will find them], and what they have to say about it. I can hardly wait to try it myself, next year. What two apples do you breed to make a Granny Smith Apple? Do I need more than one Granny Smith tree to get fruit? How many types of apple trees do we have and how can one know the difference? We currently have an Elstar apple tree and would like to know if it is better to get another apple tree or a pear tree for pollination? I have a dwarf apple tree, it was planted years ago and I don't know what kind it is, but the apples look and taste like a Granny Smith. The problem is that they are very small. Does it need to be pollinated to make the apples larger? Could it be a crab apple tree? To me, the spring makes everything OK.